Closed Fair Weather. Fairer Friends. Titus groaned and placed his large, calloused hands on his head then pressed inward slightly. The thumping of his heart reverberating against his temples was creating entirely too much noise. In his hammock, he swayed gently with the rock of the ship but the normally soothing creak of the anchors reminded him of the time a cart lost a wheel heading to Lhavit’s harbor. The axle hit the stone rod and screeched relentlessly for almost ten chimes before it finally broke and crashed. The sailor groaned again. He let his long arms fall lifelessly to the floor; his fingertips dragging against the smooth wood. 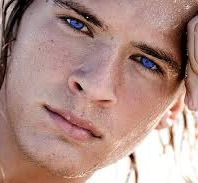 He opened his blue eyes and smelled the salt of the ocean as the warm, moist air permeated through the cabin. Another groan, this one more exaggerated as Titus brought his fists up by his neck and stretched his back. He felt like he had been drinking rum by the bottle but the more likely scenario is that he’d had a few glasses of ale but not enough water throughout the day. It was easy to get dehydrated on open water, even for a Svefra, because one simply forgets to drink adequate amounts. It’s an odd notion to wrap one’s head around but it’s something that Titus had always found to be true and would certainly help explain his present condition. The young man used the back and forth momentum of the hammock to roll out onto th floor simply by lifting his arms and legs then allowing them to fall to one side. The soft cloth sack promptly dumped him onto his hands and feet; his rump pointed up. Titus walked his hands out a few inches at a time until his back was parallel to the wood floor. With his hands placed shoulder width apart, the Svefra lifted his chin so he could stare at the door and allowed his elbows to bend. He used his strength to control the descent that brought his breastbone against the cool grain of his floor. He lingered there for a few ticks which caused his arms to begin to burn. Titus exhaled and slowly pushed his body up until his arms were straight again. When the air had been bled from his lungs, he began to take in another breath while lowering his upper body and torso once more. This slow up and down exercise went on for several chimes. When he was done, the young man brought his feet beneath him and then stood up to his full height. Maybe it was because he felt dehydrated or maybe it was due to sleeping in a hammock but regardless of the reason, his back was tight. Titus spread his feet apart a tad beyond shoulder width then extended his arms straight out from his sides. Already a little red in the face and breathing heavy from the push-ups, the young man twisted at his waist and brought his right hand down to touch his left foot. The action was almost mechanical but that was the point; legs had to be straight as did his arms. Once he made contact, the sailor reversed the motion and straightened himself back to standing. The muscles in his back stretched then recoiled, his hamstrings and bottom also feeling the pull of the forced position. Titus did not linger in his upright stance, however, and bent at the waist again to bring his left hand to his right foot. Down and up, back and forth went the dance. Laviku’s child worked at this for several chimes until his abs, glutes and face were burning. With sweat running down his face and chest, Titus was suddenly aware that he was naked. He blinked and wondered to himself if always slept naked. Maybe he did in the fair weather like they were experiencing now but not in Lhavit. All the concentration on being naked brought his mind to another subject; Dust. That girl loved to be naked. Well, maybe love wasn’t the right word but she certainly had no issues with it in any place or time of day. Titus smiled. Even though they hadn’t grown as close as he would eventually like to be, her company had made his journey infinitely better in every way. With a mumble in his native tongue, the blue eyes began to scour the cabin. While a human is easy to spot, a small bird could hide quite easily. “By Laviku’s beard, clothes insult that girl.” A few more ticks revealed her to not be in their room. A quick jog further into the belly of The Maelstrom told Titus that Dust was not there so he turned and headed to the deck. Titus made several long strides and was bathed in Syna’s light. He stopped in his tracks and closed his eyes while a wide smile grew across his face. “Ohh, I love the sun!” He purred in Common. It was getting smoother; his second language but his vocabulary was very limited. Titus ascended up to the deck and was greeted by orange and yellow rays cascading across an endless sky and being reflected by a nice, calm ocean. The Malestrom had broken port some time ago and made a heading for some place called Syka. There had been a call for settlers and it boasted some of the finest weather on the Suvan as well as a rich new piece of the world to explore. How could any Svefra resist such an offer? Titus certainly could not and when he posed the thought to Dust, she just smiled that heavenly grin and jabbered away about plans and ideas. The young man took a chime to allow the warm beams of light to tickle his form du naturel. He made slow movements as he patrolled the ship’s topside. He was checking where lines had been wrapped around cleats, the evenness of the paint and stain as well as looking for his companion. The blue eyes looked to the main boom where the sail had been dropped and rolled but she was not there. Titus continued his rounds as he moved up the port rail towards the ship’s bow. He trailed his fingers lightly against the weathered gunwhale, his eyes scanning the water for Ushaka. When his gaze came back around and his body reached the point furthest forward he turned and chuckled softly. Last edited by Titus Galesong on March 23rd, 2017, 4:20 pm, edited 3 times in total.